Move over cinnamon roll waffles, cookies & cream are coming to Bright Lights Windsor this weekend. 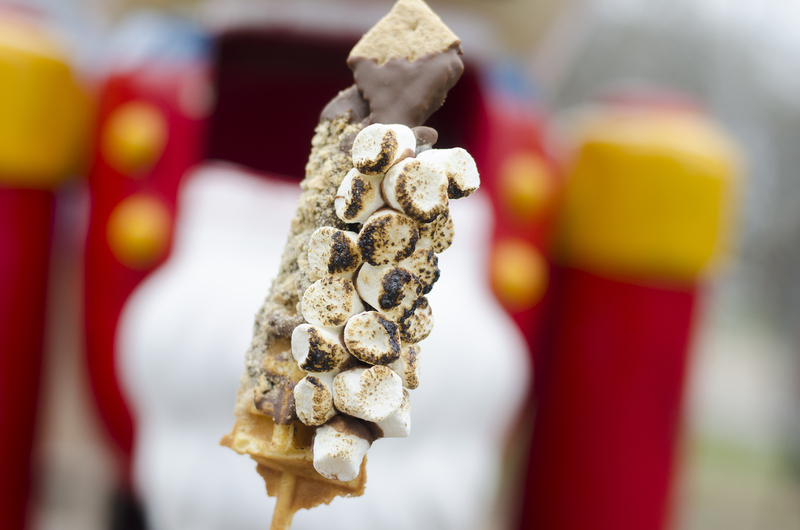 Our gourmet waffles on a stick have been all the rage each weekend at Bright Lights Windsor 2018 and we’re coming back to serve you more. Like each week prior, we’re taking one waffle out of rotation and are introducing a new one: Cookies & Cream. We encourage you to take photos of yourself enjoying the waffles using the #WindsorEats hashtag so we can share them. We’re absolutely loving all the photos we’ve seen so far. We’ll also be at Bright Lights in a more giving roll on Thursday, December 20 selling just our Christmas Tree waffle and collecting cans for the CBC Windsor Sounds of the Season food drive. We’ll also be donating $1 from every waffle sold on Thursday. S bring a can, buy a waffle and eat it with a heart full of happiness and a tummy full of tastiness. Here are the 3 gourmet waffles on a stick that we’ll be serving up at Bright Lights for Friday, December 21 and Saturday, December 22. 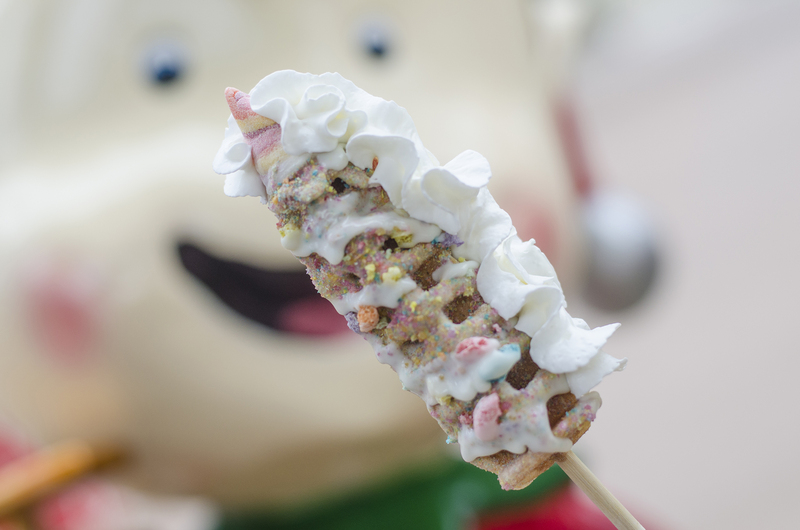 A fresh classic waffle with a coating of white chocolate and magic dust which contains fruity cereal chunks and fruity crystals. It is topped with a handcrafted Starburst unicorn horn and a whipped cream mane. Cookies & Cream in a waffle format. My life is complete. 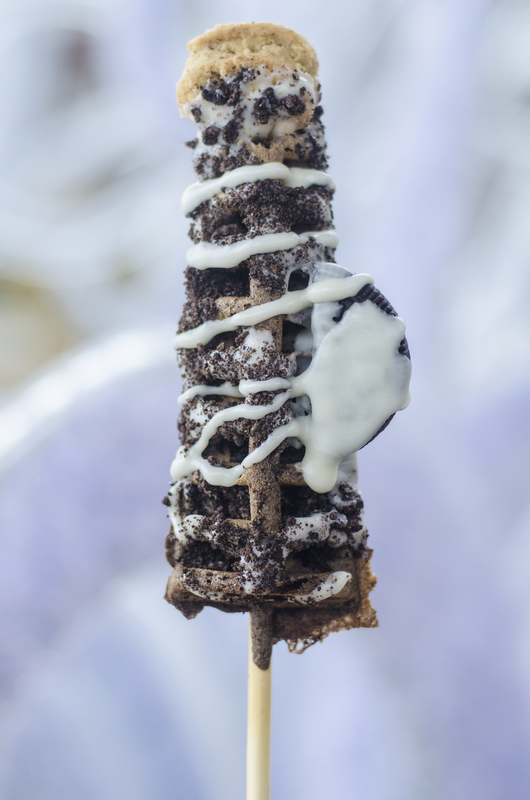 A chocolate waffle dipped in white chocolate smothered in Oreo cookie crumble. Drizzled with creamy sauce, an Oreo and tiny chocolate chip cookie.